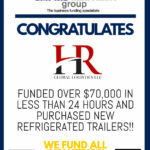 Best source for business funding. 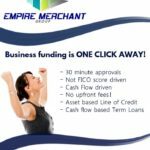 Why Empire Merchant Group is the best source for business funding? 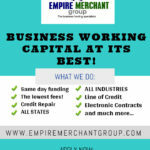 Empire Merchant group funds business owners in 24 hours or less! Administrating your own small business is not for the faint of heart. When you’re the boss, and in control of your own business plan, it can be stressful knowing that you and your employee’s well being are tied to the achievement of your idea. Most of new businesses are shutting down within the first years of operation, the odds are stacked against small businesses. The remaining ones stay open because they get creative, innovative, and aren’t afraid to look outside the box to boost their cash flow and optimize their bottom line. However, a lot of business owners get caught in the projection phase, focusing on the prospective for future profits, without the operating capital to get there. If you want to see your business grow, it’s critical that you explore ways to not only feed your future, but find ways to develop your operational cash flow for the present. Now that we gave you some tips above that will help to grow your finance and small business, remember this is not a one time fix, successful businesses are constantly implementing their methods and processes. 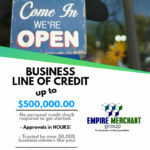 Here at Empire Merchant Group we want to see you succeed as an entrepreneur, with our line of credit https://empiremerchantgroup.com/line-of-credit/ for all type of industries. A line of credit has built-in flexibility mainly created for small business owners to grow. It helps to expand, buy more inventory and get a new truck fleet or more. 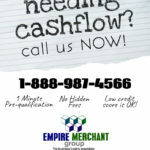 https://empiremerchantgroup.com/line-of-credit/ but most importantly our line of credit are unsecured loans. Meaning that there is no collateral backing the line of credit. Lines of Credit at Empire Merchant Group. It takes only 5 minutes to get approved for a Line of Credit with us. There are several reason why you may choose a line of credit over a traditional loan. A line of credit gives you access to money “on demand. With a traditional loan, you get a bigger amount of money and immediately begin paying the loan back, regardless of when you actually use the money. But a line of credit lets you borrow the amount you need when you need it and you start paying when you tap into those funds. Flexibility is the most important part of a line of credit since you will only pay interest when you borrow on the line of credit. Once the amount borrowed is paid, the funds are available for you to borrow again. You can choose when to take out the money, pay it back and repeat, as long as you stick to the terms, including paying off what you borrow on time and in full. Secure: Using a secured line of credit, the lender may take possession of the collateral. Unsecure: If you know exactly how much you need and you don’t want to use collateral. The best option for your company is certainly a line of credit. They work like credit cards, except without a minimum monthly payment. There are higher interest rates involved, but on the other hand you’re also only paying back what you actually spend. In many ways this balances the increased payments you’re making. Basically if you ever wished to borrow money when you need it most without the hassle of the paperwork of a traditional loan a line of credit is the way to go. So before taking out a secured or unsecured line of credit, be sure you have a plan for using the money and paying it back. Here we give you some example of ways you can spend your funds obtained by a line of credit. Looking to upgrade or buy equipment or technology for your business? It can be a challenge to replace your equipment or purchases brand new ones. Equipment financing helps to obtain all you need to make your business successful. Sometimes upgrading or buying new equipment can put a squeeze on your cash flow but with low interest rates for equipment financing, fast approvals and low fees you will be able to achieve your business needs. Click here for more information https://empiremerchantgroup.com/equiment-financing/. Since applying for an equipment loan naturally is fast and easy. You can obtain all the goodies to grow your business, such as machinery, trucks, vehicles, computers or any other need. If you don’t have the extra cash on hand, taking out a loan is a way of helping you get the equipment you need without having to put money upfront. The variety of new or used equipment you buy with the equipment loan is limited to your imagination. Therefore after pointing out your benefits let’s talk about something important low rates. Normally when we talk about rates we get a bit skeptical since you as a business owner you look for the best rate. Find below a chart of different types of financing and rates. 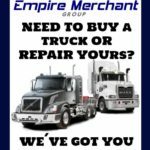 At Empire Merchant Group we consider your business needs as our priority with no hassle requirements with slightly paperwork and fast approval. If this is something you are considering, to grow your business you came to the right place! Empire Merchant Group https://empiremerchantgroup.com/equiment-financing/ start by filling our online form to get you funded as soon as possible. Empire Merchant Group es la mejor fuente de financiamiento rápido y con pocos requisitos. Empire Merchant Group ofrece todo tipo de financiamiento para la pequeña empresa: líneas de crédito, capital para compra de equipo, préstamos a largo plazo sin fiador ni garantía, entre otros. Dirigir su propia pequeña empresa no es tarea fácil. Cuando eres el jefe y tienes el control de tu propio plan de negocios, puede ser estresante saber que tu bienestar y el de tus empleados están ligados al logro de tu idea. Poner estos puntos en práctica lo ayudará a tener un crecimiento en su negocio y a aumentar el flujo de sus clientes. Sin embargo, muchos propietarios de negocios quedan atrapados en la fase de proyección, centrándose en la perspectiva de ganancias a futuro, sin el capital operativo para llegar allí. Si desea que su negocio crezca, es fundamental que explore formas no solo de alimentar su futuro, sino también de encontrar maneras de desarrollar su flujo de efectivo operativo para el presente. Ahora que le dimos algunos consejos que le ayudarán a hacer crecer sus finanzas y su pequeña empresa, recuerde que esto no es una solución única, las empresas exitosas implementan constantemente sus métodos y procesos. 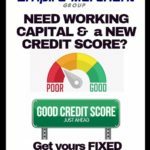 Are you struggling with bad credit? Are you tired of lenders saying “NO” due to bad credit history and need cash for your business in hurry? There is hope! 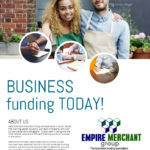 Getting the money you need to support your venture can be easy by applying for a loan through Empire Merchant Group. We offer bad credit business loans that don’t require a perfect credit score. We count mainly on your business performance – not on your credit score. A majority of our business loans for bad credit don’t show up on your credit report as an outstanding loan. And, this means that your business can take advantage of other financing programs outside of what we provide. Get guaranteed bad credit business loans for your small business in just 1 hour. Additionally you can get your credit repaired when funded with us. Contact us today at 646-868-8423 for a cost free initial evaluation. Acquiring a business loan is not easy for businesses with bad credit. Getting approved for a business loan from a bank can be extremely difficult. Many entrepreneurs quickly learn that their initial business loan was helpful in establishing and starting up – but expansion, maintenance or even growth requires additional funding which may not always be available. Bad credit not an issue! Stop turning to banks for unsecured business loans with bad or poor credit, get the financing you need quickly. Bad credit small business loans from Empire Merchant Group. Call us today at 646-868-8423 to learn more about acquiring a business loan with bad credit or poor credit history.